Peter Honey and Alan Mumford state, that in order to maximize personal learning, each learner ought to understand their own learning style and seek out opportunities to learn in their learning style. But they should also develop their learning capacity in other styles to become a more well-rounded learner. This increases versatility in learning situations. • Make a difference (for the better). Each learning style is matched with a particular stage of the learning cycle as developed by David Kolb. Using the tool provides guidance as to how people from each learning style can make the best use of their learning strengths and how learners can develop their skills in the other learning styles. Activist – hands-on; respond to learning through trial and error. 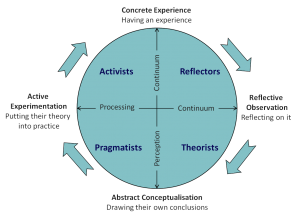 Activists involve themselves fully and without bias in new experiences. Activists enjoy the here and now, and are happy to be dominated by immediate experiences. They are open-minded, not skeptical, and this tends to make them enthusiastic about anything new. Their philosophy is: “I’ll try anything once”. Activists also tend to act first and consider the consequences afterwards. Their days are filled with activity. They tackle problems by brainstorming. As soon as the excitement from one activity has died down they are busy looking for the next. They tend to thrive on the challenge of new experiences but are bored with implementation and longer term consolidation. They are gregarious people constantly involving themselves with others but, in doing so; they seek to center all activities around themselves. Theorist – convince me; respond to learning through clarity of argument. Theorists adapt and integrate observations into complex but logically sound theories. Theorists think problems through in a vertical, step-by-step logical way. They assimilate disparate facts into coherent theories. They tend to be perfectionists who won’t rest easy until things are tidy and fit into a rational scheme. They like to analyze and synthesize. Theorists are keen on basic assumptions, principles, theories models and systems thinking. Their philosophy prizes rationality and logic. “If it’s logical its good.” Questions they frequently ask are: “Does it make sense?” “How does this fit with that?” “What are the basic assumptions?” They tend to be detached, analytical and dedicated to rational objectivity rather than anything subjective or ambiguous. Their approach to problems is consistently logical. This is their ‘mental set’ and they rigidly reject anything that doesn’t fit with it. Theorists prefer to maximize certainty and feel uncomfortable with subjective judgements, lateral thinking and anything flippant. Pragmatist – show me; they like an expert to demonstrate through application. Pragmatists are keen on trying out ideas, theories and techniques to see if they work in practice. Pragmatists positively search out new ideas and take the first opportunity to experiment with applications. They are the sort of people who return from courses brimming with new ideas that they want to try out in practice. They like to get on with things and act quickly and confidently on ideas that attract them. They tend to be impatient with ruminating and open-ended discussions. Pragmatists are essentially practical, down to earth people who like making practical decisions and solving problems. They respond to problems and opportunities ‘as a challenge’. Their philosophy is “There is always a better way” and “If it works it’s good”. Reflector – tell me; like to be briefed before they are willing to take action. Reflectors like to stand back to ponder experiences and observe them from many different perspectives. Reflectors collect data, both first-hand and from others, and prefer to think about it thoroughly before coming to a conclusion. The thorough collection and analysis of data about experiences and events is what counts, so they tend to postpone reaching definitive conclusions for as long as possible. Their philosophy is to be cautious, and are thoughtful people who like to consider all possible angles and implications before making a move. Preferring to take a back seat in meetings and discussions, Reflectors enjoy observing other people in action. They listen to others and get the drift of the discussion before making their own points. Reflectors tend to adopt a low profile and have a slightly distant, tolerant unruffled air about them. When they act it is part of a wide picture which includes the past as well as the present and others’ observations as well as their own. 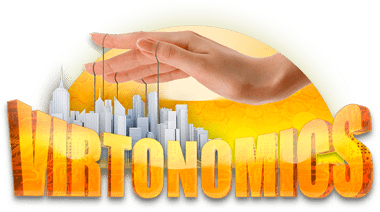 Don’t forget to check our business games in order to access experiential learning and practical skill development oriented simulated business environment!